Do you hear the Voice of Spirit? Are you ready to heed the call of your Soul? Walk with us in Beauty in our Foundation of Shamanic Practices workshop. This is an introduction to the practice of Shamanism, the most ancient spiritual practice known to humankind. In this experiential, two day workshop, doors shall open for you as you are introduced and enter the gateway onto the Shamanic Path. You will see your daily world with refreshed vision and discover the meaning of your spiritual journey. 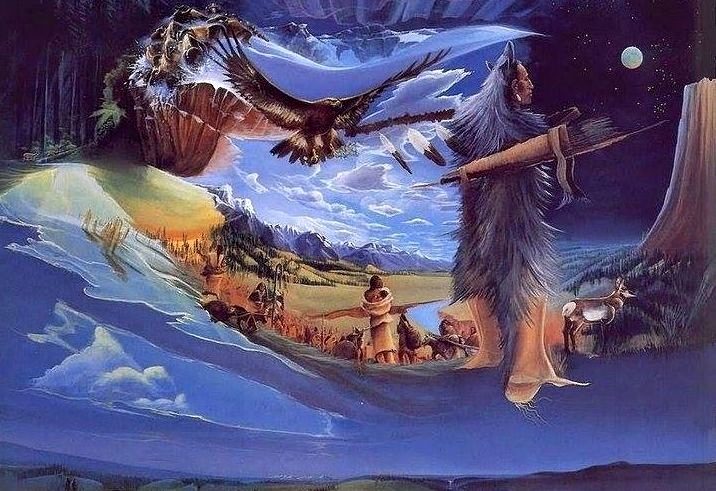 Shamanism as viewed from a global perspective while honoring the lineage of the practice. Getting out of your Mind and learn to see from the Eyes of your Heart. Introduction to Non-Ordinary Reality; using Shamanic methods to explore these hidden universes. Take an exploratory Journey to the Lower realm and then at least seven more journeys into the Lower Realm over the weekend. Learn about and discover how to work with Power Animals. Retrieve lost spiritual powers for yourself and others. Introduction and practical application of Shamanic Divination Methods. Introduction to the Upper Realm with at least six additional Upper World journeys on day 2. Meet your personal spirit helpers and teachers in Non-Ordinary Reality and receive healing in your Journeys. Learn to work with Nature and Elementals. Learn ways to seek answers and guidance for yourself and others. Ethics in Shamanic Practices is strongly emphasized through out the weekend. Each course is unique and has special lessons that are influenced by the energy and needs of the students. There is always something new and different as we always flow and listen to Spirit! Anyone looking for an accelerated spiritual growth and awakening of dormant spiritual powers. Anyone who needs answers for daily life’s problems and questions directly without the use of an intermediary. Healers and Therapist of any modality or practice. All those who would like to attend our advanced courses like Shamanic Extractions & Soul Retrievals, Psycho-pomp and our other Advanced programs. This workshop does not require any background information or knowledge. Anybody may attend and derive benefit from the knowledge of these practices. We are Twin Flames, fulfilling our Souls’ purpose by speaking, sharing, teaching, and living fully on this beautiful Shamanic Path. We are both Shamanic Practitioners, Shamanic Counselors and Agents of Change. We teach from the heart and have held beautiful, safe, sacred and intimate teaching circles around the World. Paul has been on his intuitive journey in various ways from a very young age. Highly creative, heart centered and compassionate, Paul exudes a “Grandfatherly” quality and is highly approachable. Neelam is also a highly evolved Inner Child Therapist. Dedicated to sharing her knowledge and compassionate heart with others, Neelam blends intuitive wisdom with solid understanding, creating a powerful, holistic approach, specializing in the areas of Emotional change. We have a recorded webinar titled, ‘An Intimate Conversation on Shamanism with Paul & Neelam.’ Join us for an hour of conversation about Shamanism, including some misconceptions on this beautiful spiritual pathway. Timings: August 4-5, 2018 from 9:00 am. to 6 p.m.
Out of respect to our students, seating is limited. Therefore, a mandatory, non-refundable seating deposit of 7500 INR is required to ensure your seat. Any questions you may have?